I remember my first programming gig. Being a self-taught programmer I figured it would be minutes before I would be exposed for the fraud that I was. I pictured one of the other engineers take a glance at my code, frown their eyebrows, look at me and say: “wow, that is the worst piece of code I have ever seen in my life. Did you even pass your CS 101?”. About that time, someone from HR would then storm into the office with my resume and ask “where did you go to school? I can’t find it on your resume? !” And then I would wake up in a pool of my own sweat. Well, not really. But that’s how I would do it if I was in a movie. If you’re a self taught programmer there’s no question that you had your fair share of self-conscious moments. Someone at work would start reminiscing about their college years and another would join and before you know it there’s a whole discussion going on while you’re trying to blend into the back wall before someone notices you and asks where you went to school. I know. Been there. George Boole – The man who developed Boolean Algebra and without whom computers as we know them today could not have existed was a largely self-taught English mathematician, philosopher and logician, most of whose short career was spent as the first professor of mathematics at Queen’s College, Cork in Ireland. Ada Lovelace – was the world’s first programmer. She is best known for creating the first program, designed to run on Charles Babbage’s proposed mechanical computer called the Analytical Engine. Jimmy Hendrix – considered by some to be the greatest electric guitarist in music history. In 1957, while helping his father with a side-job, Hendrix found a ukulele amongst the garbage that they were removing from an older woman’s home. She told him that he could keep the instrument, which had only one string. Learning by ear, he played single notes, following along to Elvis Presley songs, particularly Presley’s cover of Leiber and Stoller’s “Hound Dog”. Ernest Hemingway – considered as one of the greatest English-language writers. the American novelist and short story writer, was primarily self-educated after high school. Herbert Spencer – the single most famous European intellectual in the closing decades of the nineteenth century was educated in empirical science by his father. To be clear, this is not a rant against universities or against education. Quite the opposite. I’m a huge proponent of education. But I also happen to believe that there is more than one way to enlightenment and mastery. Some find formal education to be the preferred method of learning. Others, like myself, prefer to design their own curriculum and follow it at their own pace. Whatever your approach is, make sure that you never stop learning. One of my favorites is the story attributed to Jigoro Kano, the founder of Judo. According to the legend, on his death bed, Kano summoned his students and asked them to bury him in his white belt. As the most senior Judo practitioner of his time, he wanted to be remembered as a life-long learner rather than a master. Programmers don’t typically like to admit that they’re bad at Math. Also, it doesn’t help that most non-programmers have this idea that all programmers are some kind of Math geniuses. Unfortunately for me though, I wasn’t blessed with any Math superpowers. Not by a long shot. In fact, I used to hate Math more than anything else in the world. Just the thought of going to Math class at junior high brings back memories that look something out of a Pink Floyd video. By the time I got to high school I was convinced that Math was totally beyond me, that I lack that mysterious Math gene and that only people blessed with a mind for numbers can approach the subject and get good at it. I am simply not smart enough, I figured. Around the same time though, my high school began teaching us Computer Science. Quickly, I found out that I liked it and was even pretty good at it. I was solving the algorithmic problems relatively easy while other classmates were struggling and I seemed to have a knack for it. After graduating from high school, I was drafted to the army where I managed to get myself into a position of writing computer database applications. As I got better and better at it I wanted to know more. I wanted to truly understand how computers work down to the atoms, learn these more advanced algorithms I keep hearing about, understand how cryptography work, how computer animations are generated and so on. I was enthralled with the possibilities. So I signed myself up for a remote university course to study for a Computer Science degree. After exactly 4 study periods of introductory Math course, my head was spinning so hard from Set Theory that I dropped out like my life dependent on it and never looked back. I felt like a complete failure and was ashamed to be so incompetent in Math. After I finished the army, I managed to get a job as a computer programmer. Through diligent self-study of mostly books, I was able to advance my understanding of programming and software and built myself a rather successful career by average standards. But while this was fine, and my work was paying the bills, my understanding of the subject was on the surface. I lacked the in-depth understanding required to truly master the subject. And I knew it. But each time I tried to penetrate the subject matter on a deeper level, I would inevitably hit a wall. Math seemed to be everywhere. One day, while minding my own business, I ran into a TED talk given by a man named Sal Khan. Sal, previously a hedge fund analyst, quit his job in 2009 to work on a website he’d created to teach Math — for free — to anyone who wishes to learn the subject. He talked about the trouble in the Public School system: kids are moved through the curriculum in bulk, accumulating gaps in their knowledge due to a one-size-fits-all approach. So by the time they get to the more advanced subjects, their foundation was so shaky that they hit a wall they couldn’t pass. He website, he said was solving this very problem. His speech really resonated with me. But I was still skeptical. This sounds great in theory. But can I, me, personally, benefit from it? I didn’t know yet. I signed up and began watching videos and doing the exercises in order from the very beginning. I was literally doing arithmetic. The concepts were explained with crystal clarity and I could watch them again and again. I could also use the built-in exercises to practice these subjects and really drive the concepts home. Next thing you know, I began tackling more and more advanced subjects which were previously completely occluded from my understanding. And was doing so with success and even ease, now that my mathematical foundation was rock solid. Today, according to the Khan Academy website, I have mastered over 700 distinct skills. It truly recovered my Math education, my self-esteem and even ignited a real appreciation to the beauty of Mathematics. But maybe even more important than that, it unlocked many doors to understanding my profession and my real passion in life: computer programming. The image you see at the top of this post is a so-called Fractal. Fractals are patterns that are self-similar across different scales (Notice how the flower pattern repeats itself over and over as you zoom in). They are created by repeating a simple mathematical process over and over rather than describing and encoding every detail. Fractal patterns are extremely familiar, since nature is full of fractals. For instance: trees, rivers, coastlines, mountains, clouds, seashells, hurricanes, etc. The year was 2000 and I had been a soldier in the Israeli Defense Force beginning my second year of my mandatory 3 year serving term. My post in the army was nothing glamorous. By strange chance of events I found myself in charge of a small seamstress office, in a small army unit that had nothing to do with computers (I think it had about 5 computers between all its offices). Needless to say, my life was not fulfilling and I was actually quite miserable. Prior to joining the army, at high-school, I discovered my passion to programming and even did pretty well at that. Unfortunately the Deputy Commanding Officer (who hated my guts) at the unit I was serving, wanted to hear none of that when I asked for a re-appointment as a computerization officer. Additionally, my less than rudimentary high-school computer science training gave me no real-world skills when it comes to building any usable software. One day I came across an army manual which was explaining how to use Microsoft Access to build applications. 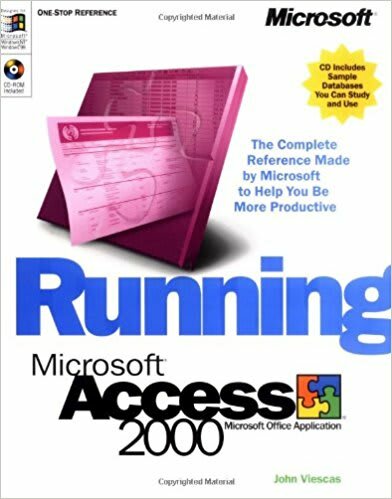 The manual was quite small and was only covering the basics but it made me realize that the army has approved Microsoft Access as a technology for building applications. Now I just needed a project. So I walked around the various offices in the unit, sniffing around for a project. After a little bit of searching, I found out that the “Hamal” (a mix of receptionist and phone operator) had stacks of hand drawn phone books and other scraps of paper all over the place with phone numbers on it. So I decided to build a phone book database. Seems easy enough. I started reading the book and got into it just enough to build the first few screens. Once I got stuck I opened the book again and resumed reading until I got my answer. Then I got back and continued writing some more code, fixed a couple more screens and hitting yet another wall. Opened the book again, continue enough to get my answer and then get back to the code. Rinse, repeat. Bear in mind, the internet was not as ubiquitous, Stack Overflow didn’t even exist for the next 8 years and Google was not really a thing yet. So my only option was to continue on with my book. After building a significant portion of the application I decided to give it a go with that phone operator guy. He seemed interested but somewhat skeptical. But was willing to give it a go. The next day, when I came to visit him, he had already entered most of his phone books and scraps of paper into the application and had a big smile on his face. This made his life so much easier — he said — and gave me my first list of feature requests. Feeling like I’m onto something, I decided to take a leap of faith and give that Deputy Commanding Officer a demo. Heck, I got nothing to lose. It’s not like I can get fired. So I walked into his office and asked if I can show him something. Reluctantly, he agreed. I started up the application and I could tell that I got his attention. I continued to explain the problem with the hand written phone books, how phone numbers get lost to wear and tear, how hard it is for the operator to share the data with other offices in the unit and the positive feedback I got from the operator. He was sold and within days I was re-appointed as a computerization officer which led to many more interesting projects (one of which was featured in the army’s magazine) and ultimately what started me on my career path.